Yes it’s true, Mark and Andy from the thearsenalhistory.com have found time between writing in official Arsenal publications and our day jobs to produce the definitive account of the start of the Arsenal, covering the ensuing years of the club in it’s short-lived guise as Dial Square and then Royal Arsenal. We uncover how Royal Arsenal grew to become the Champions of the South – encapsulating the football lives of the founders, players and administrators of the forerunners of The Arsenal Football Club. Along the way, this book chronicles how the football club emerged as an offshoot of the Dial Square cricket club, which was established after the 1886 cricket season had ended to keep the men occupied. The location of the initial Dial Square game is revealed, how the supporters responded to their team, and we reveal the club’s first programme writer – a very well-known late Victorian era poet. The real story of how Royal Arsenal became professional is a fascinating tale of how working men repelled the rapacious landlord of their ground, and at the same time, put one over the old boys’ network who ran the local Football Associations. A real tale of intrigue, underhand dealings, drunken players and “shamateurism” in Victorian era Plumstead. To my mind historians are the lifeblood of football and people with Arsenal at heart are lucky to have Mark Andrews and Andy Kelly. This masterpiece is enhanced by the skilful writing of Tim Stillman and the result is an extraordinary combination of detail with readability. 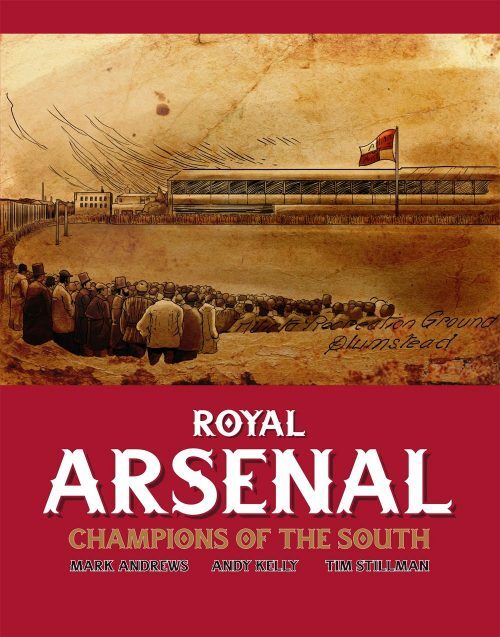 Royal Arsenal: Champions of the South is a terrific piece of work. Buy online before the end of April 2018 and get your name printed in the Arsenal fans’ Roll of Honour that will appear within the book and receive a limited edition print of Royal Arsenal at the Invicta Ground. Funny you should ask, I’ve just exchanged a few emails with Phil Windeatt about giving a talk in the Plumstead area. I have a presentation titled “Arsenal in Plumstead” which is about, er, Arsenal in Plumstead. It’s had a few airings in Islington but I’ve been meaning to look for a suitable audience south of the river for a while but struggled to find the time of late. My co-authors and publisher met and we agreed now would be a good time to do this, probably in July. I’ll drop you an email to see if we can find a suitable date.